” This Productivity Commission report was released on 1 February 2019. It has found that a new National Disability Agreement (NDA) between the Australian, State and Territory Governments is needed to facilitate cooperation, enhance accountability and clarify roles and responsibilities. 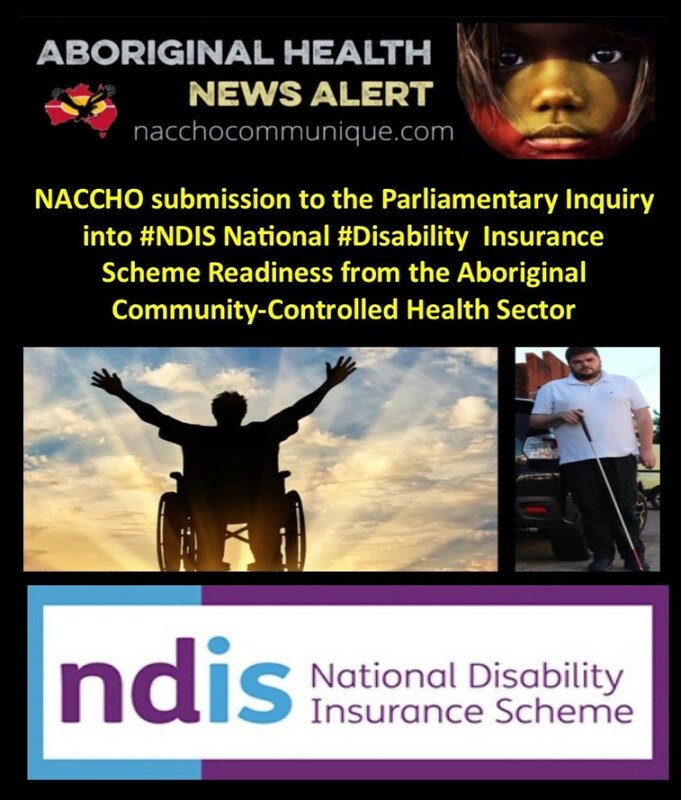 ” NACCHO lodged a submission to the Parliamentary Inquiry into NDIS Readiness on 22 February 2018. When appropriately resourced, Aboriginal Community Controlled Health Services (ACCHSs) are uniquely placed to support Aboriginal people through the NDIS to improve health and wellbeing outcomes. However, there are barriers for ACCHSs becoming providers of the NDIS including cost, thin markets as recognised by the Productivity Commission and limited Aboriginal workforce. The Productivity Commission has called for a new National Disability Agreement (NDA) between all Australian governments to promote cooperation, enhance accountability and clarify roles and responsibilities. A new agreement would help to improve the wellbeing of people with disability, particularly those not covered by the National Disability Insurance Scheme (NDIS), as well as their families and carers. Commissioner Robert Fitzgerald said, “With so much focus on the NDIS, limited attention has been placed on achieving better outcomes for the many people with disability who are not supported through the NDIS. There’s about 3.8 million people with disability in Australia who are not supported by the NDIS. Most people with disabilities are not and never will be covered by the NDIS yet their rights, needs and aspirations matter”. The Productivity Commission identified in a report released today that the disability policy landscape has changed dramatically since the current agreement commenced a decade ago and much of what is in it is now outdated and irrelevant. In particular, the current agreement does not reflect the implementation of the NDIS or the National Disability Strategy. “There has been very little progress in meeting previously agreed goals such as raising labour force participation rates for people with disability or improving the wellbeing of carers. We have identified key gaps in the areas of advocacy services, support for carers, and supports for people with disabilities arising from mental health conditions, as well as access to community and inclusion programs,” Commissioner Fitzgerald said. The Commission’s report concludes that a new, reinvigorated NDA could be a strong positive force to guide future disability policy, to promote better access to mainstream and disability services and to improve outcomes for people with disability. The Commission recommends that the new NDA clearly set out the responsibilities of governments to provide disability services outside the NDIS, and to affirm the commitment of governments to address service gaps and barriers that people with disability face in accessing mainstream services. “Improving the wellbeing of all people with disability, their families and carers requires a collaborative response from all levels of government, extending well beyond the NDIS to many other service systems such as housing, transport, health, justice and education,” Commissioner Fitzgerald said. The Commission also recommends that the new NDA set out a single, strengthened national performance reporting framework, with progress towards the outcomes of the new NDA publicly disseminated via a new National Disability Report, to be tabled in Parliament every two years. The full study report about the National Disability Agreement Review can be accessed from the Commission’s website at http://www.pc.gov.au. This is the first of the Commission’s reviews of nationally significant sector-wide agreements between the Australian and State and Territory Governments. In 2008, the Australian and State and Territory Governments agreed on a new framework for federal financial relations, to provide a foundation for collaboration on policy and service delivery, and to facilitate the implementation of reforms in areas of national importance. The centrepiece of this arrangement was the establishment of six National Agreements covering disability, education, health, housing, Indigenous reform, and skills and workforce development. 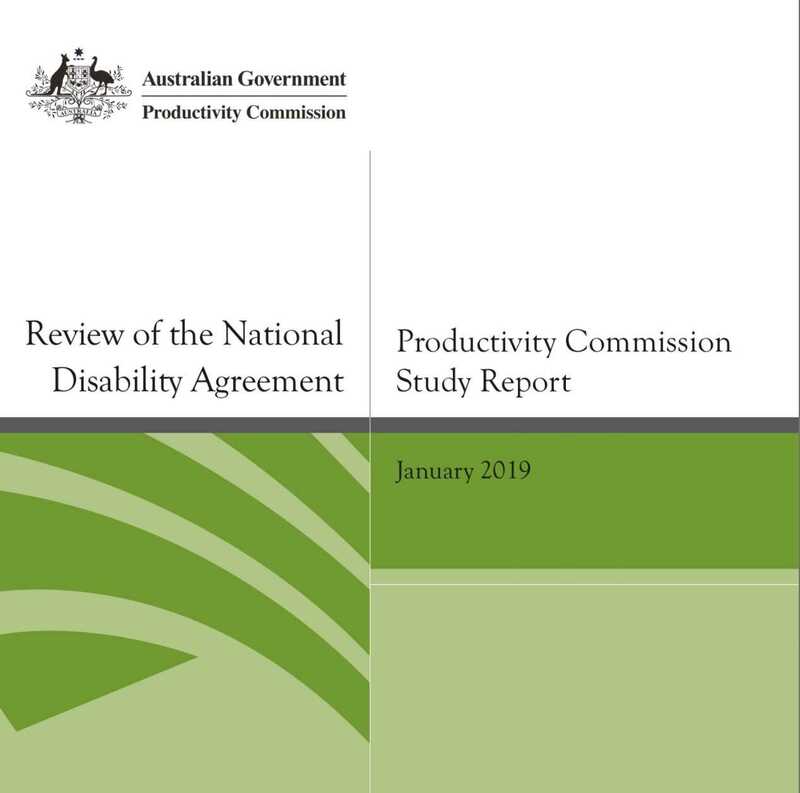 The Australian Government has asked the Productivity Commission to review nationally significant sector‑wide agreements, beginning with the National Disability Agreement (NDA) (box 1). The Commission was asked to consider the relevance of the agreement in the context of contemporary policy settings and whether it needs updating in light of these. The current National Disability Agreement (NDA) no longer serves its purpose, has a weak influence on policy, and its performance targets show no progress in improving the wellbeing of people with disability. A new agreement is needed to promote cooperation, enhance accountability and clarify roles and responsibilities of governments. The disability policy landscape has changed markedly since the NDA was signed in 2008. The National Disability Insurance Scheme (NDIS) commenced in 2013, focusing on supports for approximately 475 000 people with significant and permanent disability. And the National Disability Strategy (NDS), which covers all people with disability (approximately 4.3 million), was endorsed by all Australian Governments in 2011. Improving the wellbeing of people with disability and carers across the nation requires a collaborative response from all levels of government, extending well beyond the NDIS to many other service systems, such as housing, transport, health, justice, and education. 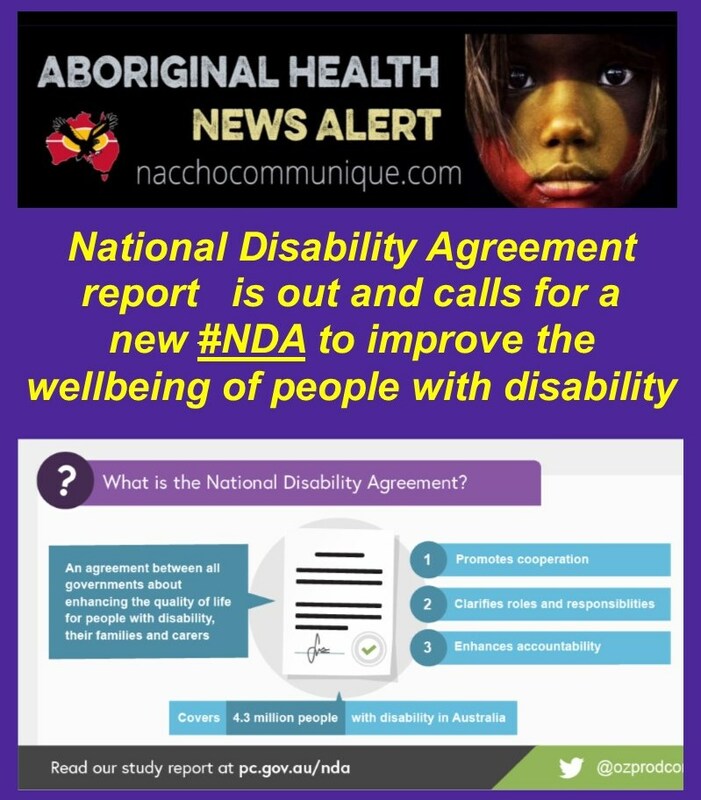 There is an important role for a new NDA that has at its core, the wellbeing and needs of all people with disability and their families and carers. The purpose of a new NDA would be to provide an overarching agreement for disability policy, to clarify roles and responsibilities, to promote cooperation and to enhance accountability. outline the roles and responsibilities of governments in progressing that objective; the outcomes being sought for people with disability; and a nationally consistent performance reporting framework for tracking progress against those outcomes. The NDS should continue to play the essential role of articulating policy actions, with these actions explicitly linked to the new NDA’s outcomes. The agreements governing the NDIS would remain separate to the NDA, but should be referenced throughout so that the NDA is reflective of the whole disability system. 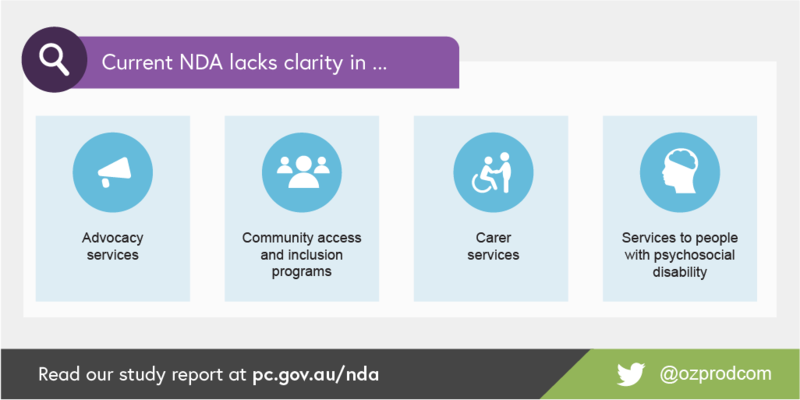 Roles and responsibilities in the NDA need to be updated to reflect contemporary policy settings, to reduce uncertainty and to address gaps in several areas — including in relation to advocacy, carers, and the interface between the NDIS and mainstream service systems. To facilitate greater clarity in responsibilities, governments should articulate and publish which programs they are rolling into the NDIS and how they will support people with disability who are not covered by the NDIS. They should also (through the COAG Disability Reform Council (DRC)) undertake a comprehensive gap analysis, with the new NDA outlining responsibilities for addressing any gaps. A gap analysis should be undertaken every five years. NDA performance reporting needs strengthening to improve transparency and accountability. There should be a single person‑centred national performance reporting arrangement across the NDA and NDS, with performance indicators and targets agreed to by the DRC. A ‘National Disability Report’ should be tabled in Parliament biennially, outlining progress against the NDA’s outcomes and performance metrics, and including the perspectives of people with disability and findings from policy evaluations undertaken as part of the NDA. A new NDA should be agreed by the start of 2020. It should be a living document, with updates made to schedules as required, and should be independently reviewed every five years. Part 2 :The Federal Government has welcomes the release of the Productivity Commission’s Final Report of its Review of the National Disability Agreement. 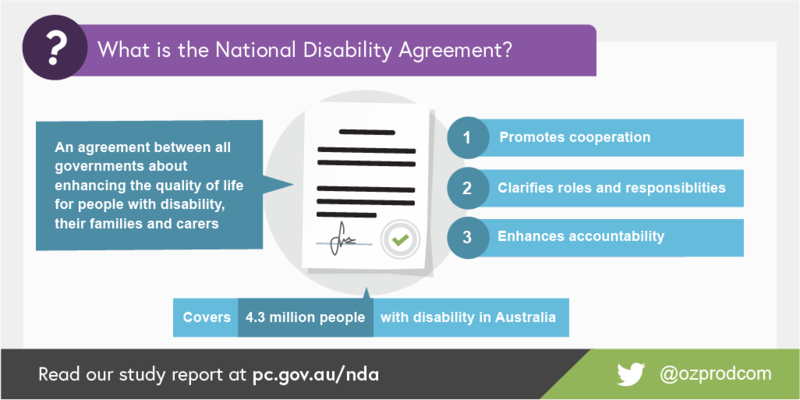 The National Disability Agreement is a high-level accord between the Commonwealth and state and territory governments that sets out roles and responsibilities for the funding and provision of specialist services for people with disability. “The Australian Government will continue to work with all governments, people with disability and the disability sector to consider the findings and recommendations of the Report as we develop a new strategy,” Minister for Families and Social Services, Paul Fletcher, said. “With one-in-five Australians living with disability, it is critical for governments to work together to help people with disability take control of their lives and have equal access and opportunity. “We recognise the disability policy landscape has changed significantly since the agreement was first signed in 2008. Mr Fletcher said work has already started on developing the new National Disability Strategy for beyond 2020, with public consultation starting later this year. “We understand the need for a renewed commitment between the Commonwealth and the states and territories,” Mr Fletcher said. Assistant Minister for Social Services, Housing and Disability Services, Sarah Henderson, said the report reflects the enormous commitment to people with disability by all levels of government, providers, families and carers, and the community. “We can all acknowledge that people with disability can face challenges with accessing and navigating mainstream services and the report highlights the need for all governments to focus more on overcoming these challenges,” Ms Henderson said. The NDIS was never intended to replace all services that state and territory governments provide for people with disability, nor does it remove state and territory responsibility for providing disability support for people under 65 (under 50 for Aboriginal and Torres Strait Islander people) who are not eligible for the NDIS. More than 250,000 Australians are now being supported by the NDIS including 78,000 receiving life-changing supports for the first time. As at 30 September 2018, 91 per cent of NDIS participants were also accessing mainstream services and supports. Part 3 : The Australian Federation of Disability Organisations (AFDO) fully supports the recommendations and commends the Productivity Commission in its latest review outcomes into the National Disability Agreements (NDA). AFDO urges the Federal Government and every State & Territory government to adopt these recommendations and through the Council of Australian Governments (COAG) commence building these recommendations into a new NDA inclusive of relevant funding, outcomes and reporting. “I commend the work and the depth of consultation which Commissioner Robert Fitzgerald and the Productivity Commission team have undertaken which is reflected in the richness of the recommendations, they have nailed it!, said Mr Joyce, CEO of AFDO. “We have been very concerned about the ongoing confusion over responsibilities and service provision across jurisdictions following the implementation and roll-out of the National Disability Insurance Scheme (NDIS) particularly for the 4+ million Australians with disability who are not and never will be covered by the NDIS. The NDIS is essential and will cover 460 thousand Australians at full roll-out, those outside of this and ineligible to join still need relevant supports across all communities. All State & Territory Governments have an ongoing responsibility to people with disability to provide relevant services and supports, no different to anyone else”, advised Mr Joyce. “We need the Federal Government and all State/Territory Governments to get on board, endorse these and ensure that agreed funding is provided to enable implementation in an effective and timely manner”, said Mr Joyce. The full review by the Productivity Commission is available here. NACCHO lodged a submission to the Parliamentary Inquiry into NDIS Readiness on 22 February 2018. When appropriately resourced, Aboriginal Community Controlled Health Services (ACCHSs) are uniquely placed to support Aboriginal people through the NDIS to improve health and wellbeing outcomes. However, there are barriers for ACCHSs becoming providers of the NDIS including cost, thin markets as recognised by the Productivity Commission and limited Aboriginal workforce. The submission also highlights the barriers many Aboriginal people face in accessing NDIS services which include not fitting the assumed client model, limited NDIS service providers in rural and remote areas and not catering for the specific needs of Aboriginal culture. NACCHO is supportive of the NDIS and understands it is a complex and highly valued national reform. If implemented well, the NDIS will substantially improve the health and wellbeing of people with a disability and Australians more generally. We are keen to collaborate with the Commonwealth Government to develop better solutions for Aboriginal people with a disability.